NeXtRAD is a dual-band, dual-polarization, multistatic radar system under development at the University of Cape Town (UCT) in collaboration with University College London (UCL). The primary mission of the system is to collect multistatic data of small radar cross-section maritime targets embedded in sea clutter. 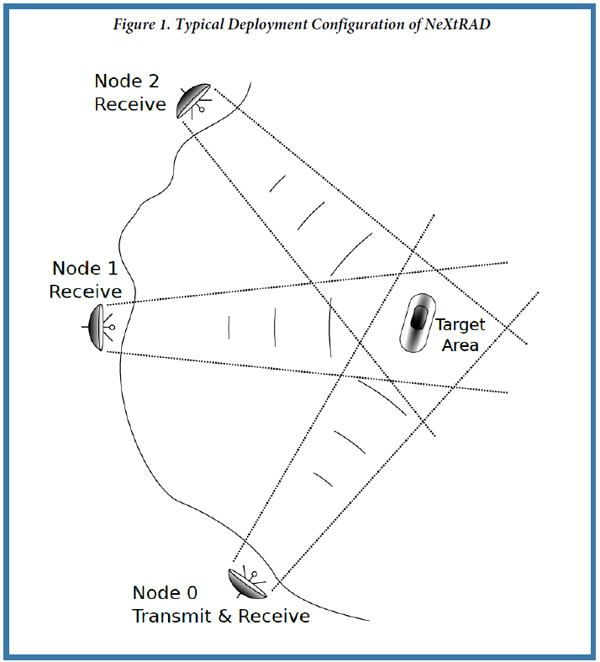 NeXtRAD is a multi-sensor network comprised of three stations (or nodes) separated by several hundred meters, all focussing on a common target area as shown in Figure 1. Only node 0 generates and receives radar signals, while nodes 1 and 2 are receive only. The system requires a usable bandwidth of 50 MHz to achieve a range resolution of three meters. Each node has dual-polarized L- and X-band antennas (IEEE definition) with a 10-degree beamwidth. During the early stages of the NeXtRAD project, Pentek's Cobalt® Model 71621 transceiver system was identified as a suitable software-defined radio interface for the system. 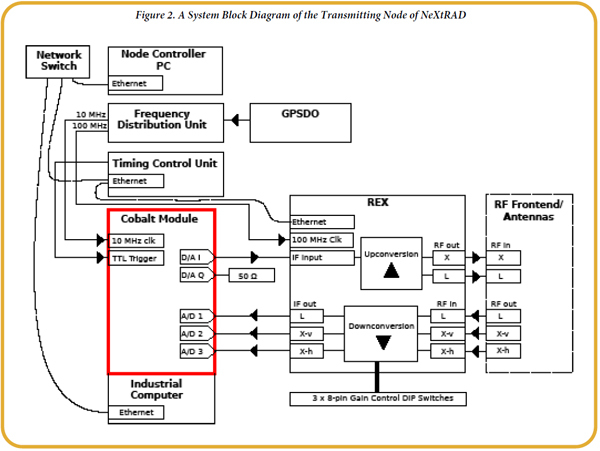 This article presents the early stages of the development of NeXtRAD, which uses Pentek's Model 71621 module as the digital transceiver of the system in a monostatic configuration. 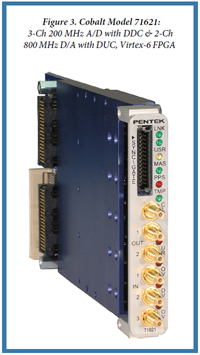 Pentek's Cobalt Model 71621 (Figure 3) was selected as the SDR interface because it is well-suited to the radar's requirements, providing three A/D converters and a dual-channel 800 MHz D/A converter. NeXtRAD is a pulse-Doppler radar, which requires that waveform generation and digitization be fully coherent at each node. To achieve coherency, each node is supplied a very stable 10 MHz reference signal from a local GPS-disciplined oscillator (GPSDO), which is distributed via a frequency distribution unit (FDU) to the Cobalt module and to the receiver exciter (REX). This ensures that there is no phase drift between oscillators in a given node, and that the relative phase of oscillators between any two nodes is constant. The Cobalt module can be configured to accept the 10 MHz signal from its front panel SSMC clock input. The GPSDO also supplies a trigger pulse which precisely synchronises the start of a radar measurement. After an initial trigger event from the GPSDO, the TCU takes over and delivers the trigger pulse to the Cobalt module at the pulse repetition frequency (PRF). The transmitted pulse is generated by the Cobalt module in the active node of the sensor network. The system employs linear frequency-modulated pulses with 50 MHz bandwidth and duration of 1 to 10 micro seconds, at a PRF from 1 to 2 kHz. The Cobalt module is able to supply the 50 MHz bandwidth signal on a 125 MHz intermediate frequency (IF) at a 720 MHz output frequency from one of its two available 16-bit D/A output channels. The REX upconverts the IF waveform to either L- or X-band. After amplification, the waveform is transmitted via the appropriate antenna to illuminate the target area with either vertical or horizontal polarization. Transmitted energy is scattered in many directions by the target scene. Antennas at each node location intercept only a tiny fraction of that energy. The Lband signal is captured in either vertical or horizontal polarization, and two X-band channels simultaneously record both polarizations. Receivers in each node amplify and downconvert the received signals to the 125 MHz IF analog signal. A dedicated A/D channel on the Cobalt module records the single L- and two Xband waveforms. The signal planning for the transmit and receive chains is similar to that described in a tracking radar application in Pentek Pipeline Vol. 19, No. 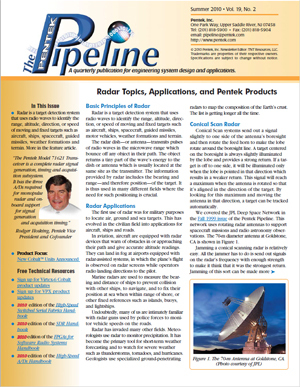 2, "Radar Topics, Applications, and Pentek Products". In NeXtRAD, the waveform engine on the Cobalt module stores a variety of waveforms in the onboard DDR3 RAM. Waveform generation is triggered by an LVTTL rising edge delivered to the trigger input on the Cobalt module's front panel. The data input rate to the Texas Instruments DAC5688 D/A module is 180 MSPS. The digital upconverter (DUC) in the D/A translates the spectrum from 0 Hz to the IF. With an interpolation factor of 4, the output sample rate of the DAC is increased to 720 MSPS. The intermediate frequency signal is then upconverted to RF by the REX for amplification. Pipeline Vol. 19, No. 2, "Radar Topics, Applications, and Pentek Products"
On the receive chain, the RF signal received at the antennas is downconverted to the IF for digitization by the A/D modules on the Cobalt module. The same trigger signal is used to initiate digitization at each pulse. The ADC is tuned to sample at Fs = 180 MHz. This places the incoming signal in the second Nyquist zone and results in the spectrum being translated to the first Nyquist zone from 0 to Fs/2, i.e., from 30 to 80 MHz. Tuning the digital downconverter IP core on the Cobalt module to 55 MHz and setting the decimation factor to 2 translates the incoming signal to DC and produces IQ samples at Fs/2 = 90 MHz. 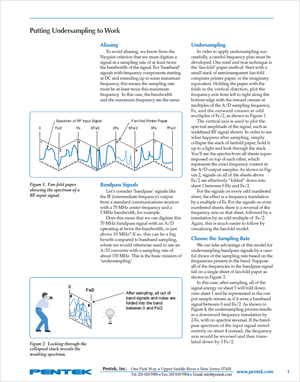 A helpful explanation of undersampling is given in "Putting Undersampling to Work," which you can download here. The downconverted, 16-bit complex samples are then transferred via the PCIe 8x interface to the host computer's memory for post-processing. An important consideration for the coherency of the radar is that the numerically controlled oscillators in the digital upconverter of the D/A and the digital downcovnerter IP core on the FPGA need to be reset to a known value on each rising edge of the external trigger. If this is not done, an unpredictable phase term is introduced to the IF signal from the D/A, and also to the discrete baseband signal generated by the digital downconverter (DDC). The phase of the digital sine and cosine terms generated in the DUC and DDC can be reset to zero on rising edges of the external trigger with proper configuration of the control registers for the DAC5688 and the DDC IP core. 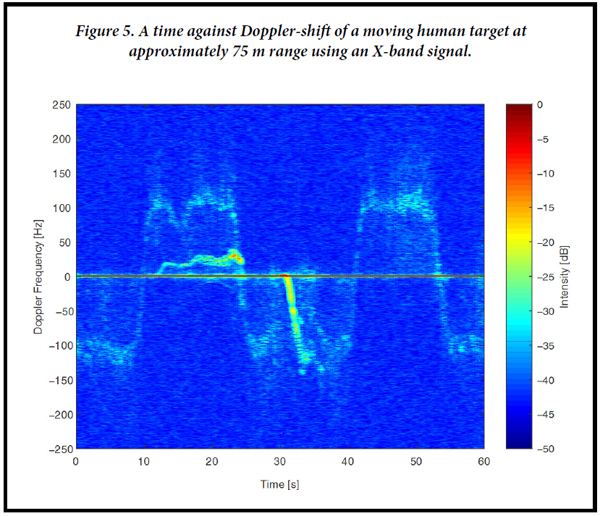 This ensures that phase offsets introduced to the radar signal on generation or digitization can be ignored in post-processing as they do not vary between pulse repetition intervals. The controller software for the Cobalt module was developed using Pentek's ReadyFlow® software libraries, in conjunction with an arbitrary waveform generator, spectrum analyzer, and an oscilloscope. The digitization and waveform generation chains were developed and tested in separate controller programs before fusing these programs into a working source. A simple IF loop-back test using one of the D/A output channels and a signal splitter was sufficient do most of the development required for the digital transceiver before introducing the REX and other subsystems. 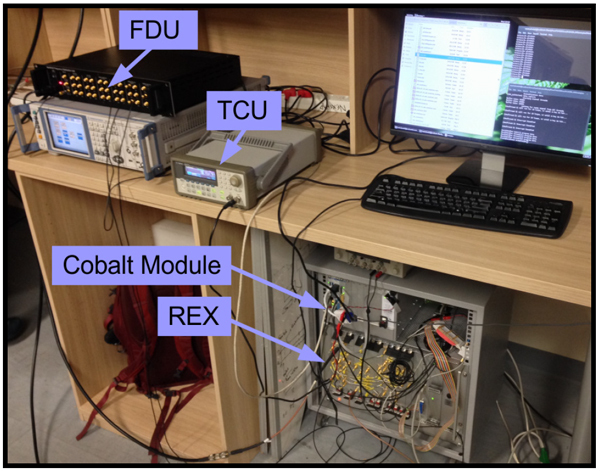 The hardware configuration shown in Figure 4 was used to test a low-power (<24dBm transmit power) bench-top prototype of the active node, using an AWG to supply a rising-edge trigger to the Cobalt module and signal generators to supply synchronized reference signals to the REX and the Cobalt module. where c is the speed of light, Fd is the Doppler shift, and Fc is the carrier frequency. With Fc = 8.5GHz (X-band) and Fd = 100 Hz at t=5s in the graph of Figure 5, the target is inbound at approximately 1.7 m/s. The large object seen moving from approximately 10 to 22 seconds and then from 30 to 32 seconds was a car backing out of a parking bay and driving away. Passive nodes are essentially identical to the active node, except for the transmitters which are not needed. Using virtually the same controlling software for the Cobalt module in the active node, passive nodes can record waveforms at precisely the same moment as in the active node. The initial testing of the Cobalt module in the active node of the system demonstrated that the Pentek Model 71621 was well-suited to a pulse-Doppler radar application. With the required additional hardware, the passive nodes can be introduced to the network with minor alterations to code for the active node's digital transceiver. Overall, the Cobalt module met our requirements for phase stability and bandwidth, and it was easily integrated with the existing receiver exciter for the active node. The author would like to thank the following organizations for their generous financial support of the NeXtRAD project: ONR Global, the IET for the AF Harvey Research Prize, the South African National Defence Force, and the National Research Foundation of South Africa.